Many women are wired to say "yes." That need to be all things to all people at all times. We pride ourselves on being exceptional multitaskers, who can exist on very little sleep, and have no limits to how much we can accomplish in a single day. We truly believe we are Wonder Woman: We can do it all — and do it all by ourselves. Women say "yes" to so many things that we get overloaded, overwhelmed, and feel deeply underappreciated. Spreading yourself too thin in the workplace and assuming an unrealistic amount of additional responsibilities is one of the fastest ways to kill a career. Surprisingly, toddlers actually possess the key to success. That's right, that little monster running your life holds the key! Toddlers have the innate ability to say "no" — willingly, freely, and frequently — to almost anything without reservation or hesitation. 1. Greater clarity. When you say "no" to extraneous activities and commitments, it provides greater clarity and allows you to discover what's really important. Saying "yes" when you really want to say "no" causes confusion not clarity. Trust that when you say "no," you're really saying "yes" to a greater opportunity that's more aligned with your expertise, goals, and values. 2. Deeper connections. Developing quality relationships is not only important in our personal lives, it's imperative to the success of our professional lives. Saying "no" to insignificant and unrelated activities allows us to concentrate our efforts on creating meaningful relationships and an effective network with the people that mean the most. 3. More balance. Success is measured not only in the workplace, but also in life. As much as we would like to compartmentalize our lives and keep our work and home lives separate, we can't. They're all connected. Committing to fewer obligations enables you to relax, to enjoy more time with family and friends, and to get energized by those activities that bring you joy and feed your soul. 4. Increased confidence. Saying "no" and setting clear and intentional boundaries increases your confidence in the workplace. It elevates your authority and people take you seriously. Instead of being perceived as easy to manipulate and overly eager to please, people recognize your authority and respect your decision-making. Stand firm, stay confident, and say "no." 5. Faster success. 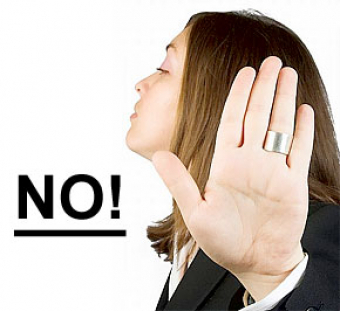 Saying "no" appropriately and professionally empowers you to expedite and streamline your career path. You can reach your goals faster, more efficiently, and gain greater respect by eliminating, or reducing, the number of irrelevant and time-consuming activities you pursue. Though we can't throw a tantrum like a toddler, we can fully embrace the power of saying "no" when it's connected to conscious, intentional, and mature decision-making. Be confident in your convictions, and you'll discover the opportunities and actions that truly merit a "yes."